I will write another article, moreover I hope everyone is reading it may be helping, reflecting or adding something in your lives, because my intention is only to help and pass on what I learned and learn every day. I know I will not please everyone, because it would be very selfish on my part, however, I can’t control people through my words and action. Anyway, you have ever wondered, what are we? Or rather, asking yourself, who am I? Therefore, some people have doubts about this fact, and I believe most of them at least seeks to know about it. 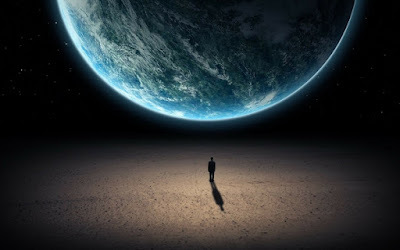 Sometimes it's hard to be asking for yourself, how, where and when humans came to this planet, after all, the Planet Earth is not the only one in the Universe and much less in the unseen worlds. To get an idea of the dimension, we should regress since when the world was created, but the point is not this, but trying to conduct an internal reading in us, when we see bizarre situations and meaningless, thus for some is out of true consciousness we live in, where some people are seeing only "Machines" and not "Souls," they judge or remain with doubts in their minds. Well, nothing came ready for us! It is stamped in our lives. Have you ever thought that everything would come ready for us? There would not be the "work of progress" everything would be emptiness and without feeling, because the work of the internal revolution becomes us strong, smart and great wisdom, the conquests and losses of our day-to-day, leading to the progress, and this progress is to reach the highest point, where few people get in. What could we say about some ignorant human and other peaceful? They came ready? The answer is NO! As I said earlier, there is the work of internal revolution, coming with patience, determination and resignation. It would be an ignorance or selfishness think that people acquire the "Wisdom" and "Morality" and a unique existence on the Planet, and that they will never get another chance and everything is FINISHED in their lives. Not my brethren, life goes on, and the universe does not STOP! We will always get a new chance to change and be the best in our lives. Death is a STEP and not END! We should think every time we can be the best, and removing the pride of thinking that we are "good enough” to supply the needs of our neighbor. What the neighbor needs is "YOU" changing your awareness to one open side, fair and peaceful, taking the love and charity for them, not just leave, but DOING! If we change, the world changes, if the world changes, things change. We are unique diamonds and need to be polished to become shiny, but no one is like another, even with similar attitudes, but the soul and fingerprints are unique! Think about it, we are very strong and we must use this power to illuminate what is dark, and relieve what is painful.